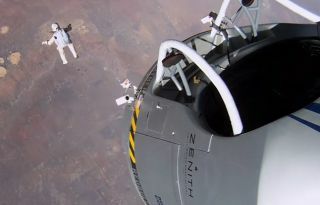 Daredevil skydiver Felix Baumgartner leaps from his Red Bull Stratos capsule in this still from GoPro's Super Bowl XLVII commercial. Baumgartner made the jump on Oct. 14, 2012, leaping from 24 miles (39 km) up and breaking the sound barrier during the record-breaking jump. Super Bowl XLVIII is almost upon us and that means awesome football and awesome commercials, including one by the camera company GoPro that retells the spectacular supersonic "space jump" by daredevil skydiver Felix Baumgartner. "From the depths of the ocean to the far reaches of Earth's atmosphere, GoPro cameras make it possible to capture all of life's incredible moments," GoPro officials said in a press release. "GoPro's Super Bowl XLVIII commercial documents one man's extraordinary courage to jump from the edge of space—with GoPro cameras recording every record-breaking moment." Red Bull Stratos officials at the time billed Baumgartner's feat as a "space jump," or a skydive "from the edge of space," though Baumgartner actually leaped from the Earth's upper atmosphere. That does not, however, make Baumgartner's achievement — or the views from the cameras he wore — any less amazing. The image of the Earth reflected on Baumgartner's helmet faceplate is one of the highlights. The views even capture the harrowing spin Baumgartner experienced as he plummeted toward Earth on his back until he could regain control and flip over into a stable, Earth-facing position. "From the airless freeze of outer space, to the record-breaking free fall and momentous return to ground—see it all through Felix's eyes as captured by GoPro, and experience this incredible mission like never before," GoPro officials said.